We’ve all been there. You are in a rush and still want to put a bit of make up on so that you don’t look half dead, but it has to be done quick. 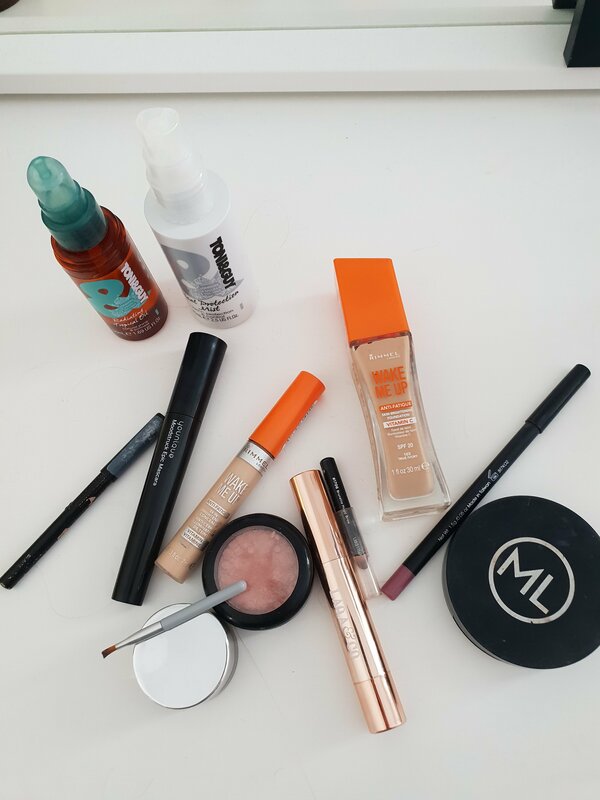 So I thought I’d write about my makeup routine for those days when you really can’t be bothered but still want a bit of something on your face. First off I apply some primer. I used In Transit Camera Close Up by It works . Then I apply Rimmel Wake Me Up Anti Fatigue Skin Brightening Foundation in the colour True Ivory this is really good as it as an SPF of 20 so protects your skin at the same time. I often use cheaper makeup for those days when I’m not particularly doing anything special. I don’t see the point in using the expensive stuff just to go to work (I’m a nurse) or sitting around the house all day. I do like my Rimmel though and it does the job. The next step is to highlight under my eyes (so that I don’t look shattered and to hide the bags), down the bridge of my nose, forehead and chin. I use Rimmel Wake Me Up Anti Fatigue concealer in the colour Ivory . I find this just really brightens my face and is also good for dotting on those spots for some extra coverage. Next I add a bit of contour to my cheekbones and forehead using Model Launcher Safari Sun bronzer I love this bronzer with lots of different bronzing tones. Then use Karl Lagerfeld Baked Blush in Rose Pink this acts as a gorgeous highlighter above my cheek bones and gives off fabulous definition and structure to my face. Next to sort the brows and to do this I use Lord and Berry eyebrow pencil and Bang Beauty eyebrow gel. then I go over the bottom outer corner of my eyes with Rimmel Kohl black eyeliner and also apply this to the tightline to add more texture and definition to my eyelashes. I finish off by using Youniques Epic Mascara in the colour black and adding a dash of colour to my lips using Karl Lagerfeld lipliner and Laqa and Co Cloud lips. Thanks for reading . Please follow my blog if you enjoy reading or sign up to emails !